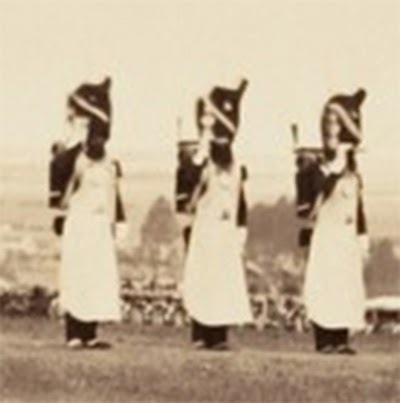 The differant detachments of the Infantry and Cavalry for the Service Battalions and Squadrons at the Chateau are also placed under the command of a Superior Officer of the Guard, who was senior to the Colonel, Commandant du Chateau, and usually a General Aide de Camp to the Emperor on Duty. 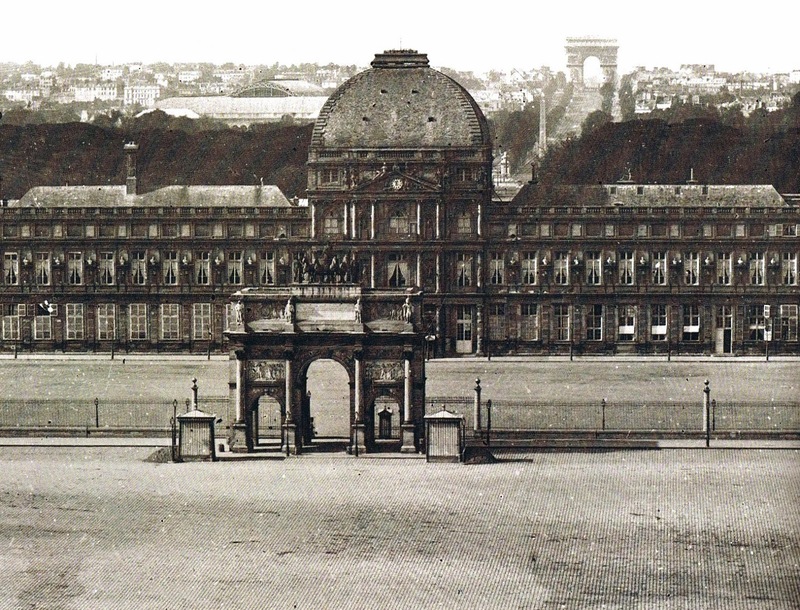 The Troops departed from their quarters for the Courtyard of the Tuileries before eleven o'clock in the morning. When the Guard was mounted at the Ecole-Militaire, there arrived one of the Ecuries of the Emperor, situated on the Quai d'Orsay, a dozen charming small ponies mounted by grooms wearing a green livery. They formed a rank in the Courtyard facing the band. These horses, destined for the young Prince [Imperiale] for which their training was complete, so that they were prepared for military noises of all kinds. When this little column arrives at the Gate of the Cavalry [Grille de la Cavalerie] which leads onto the Avenue de la Motte-Pquet, nothing was as graceful as these small horses so pretty and so montes, following the last row of music and accompanied by a gentle movement of the head one of those catchy quick-steps composed by the excellent bandmaster of the 2e Voltigeurs, Sellenick. The Cavalry were followed by the Infantry, directed towards the Pont Royal, which they had to cross to enter the Chateau by the small gate called L'Empereur. 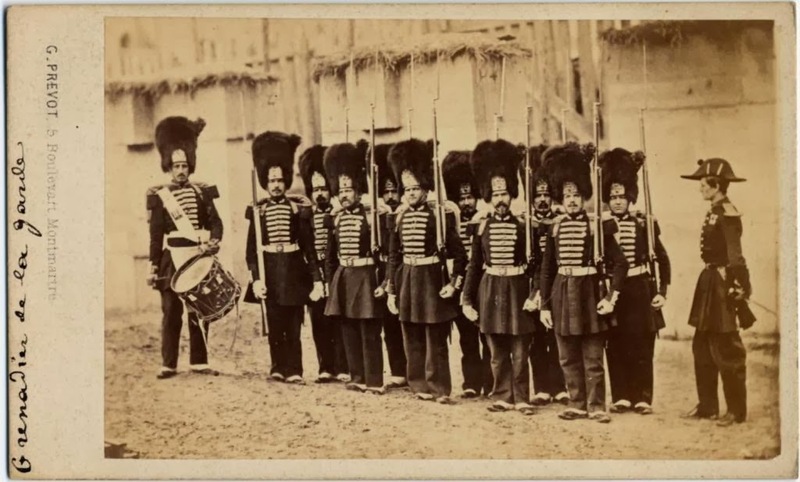 When the Sapeurs with their white aprons, often with the cross of honour and other commemorative medals attached, arrived at one of the Guard Houses by the wicket gate, the Guard shouted out "Halt! Who goes there?" And the column would stop. The Drummers and Music would stop playing. The Corporal Sapeur beats on the gate. A Corporal and two men came out of the Sentry Houses and moved in front of the sentries and presented arms. The Corporal repeated"Who goes there?" To which was responded "France!" ; "Which Regiment?". The Corporal-Sapeur replied again "Imperial Guard, 1st Regiment of Grenadiers!" The Corporal on Sentry answered "Go as you please." The troops resume their march; the drums begin to beat ; the trumpets bray, fifes and music play; the troops file into the Courtyard procded by their superb Tambour-Major... The troops form En Bataille in face of the Chateau, the Cavalry on the left of the Infantry. The Eagle is placed in the centre of the Line, and the Colonel commanding the Chateau and the General Commanding the Guard passes through the ranks on inspection. The Guard then marches past and after this last movement, is detailed off to provide the Sentries who occupy the differant posts of the Chateau. The Eagle of the Regiment is furnishsed with a Guard and is laid upon two fascines of muskets facing the Guard House which is opposite the Pavillon d'Horloge.